In today’s technological age, part of the package is that you always need power to charge your devices. Well, at times, that can be problem when you’re planning a trip of epicness into the wilderness. 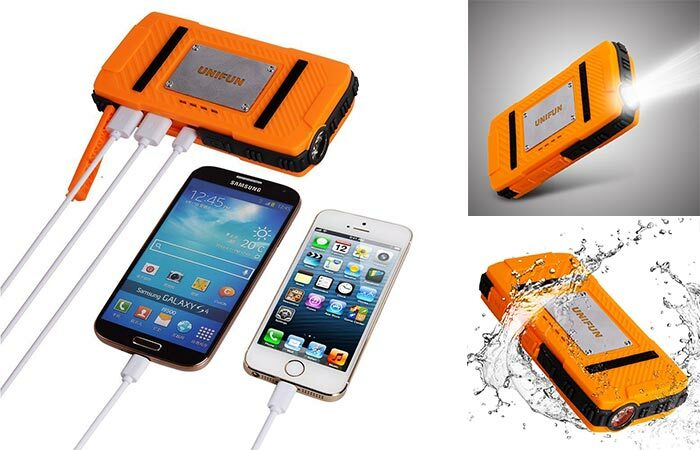 Thanks to the Unifun Waterproof Power Bank that will never be a problem again! Super rugged in design, the Unifun has a rating of IP66. 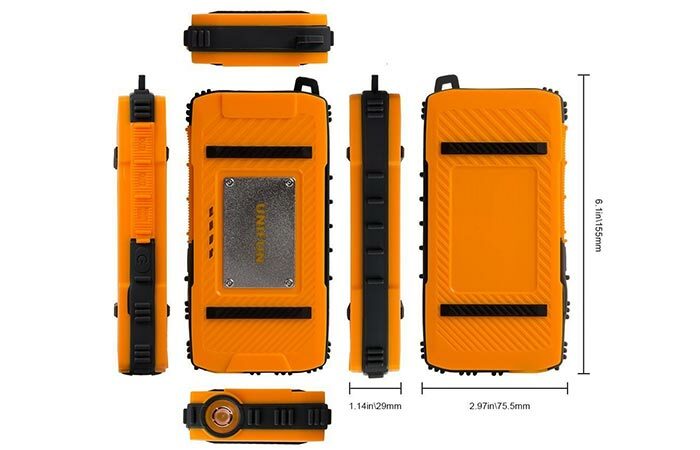 This means that it is waterproof, dustproof, anti-shock and skid resistant. Compact, rugged, and lightweight, the Unifun is ready for any adventure! Basically, being as tough as it is, it is perfect for hikers, campers, skiers, construction workers, and outdoor enthusiasts in general. It also boasts a massive 10400mAh capacity; this means that it has enough juice to charge any iPhone 5 times, or large capacity mobiles, such as the Galaxy S4 more than three times. The Unifun features dual USB output ports, an LED flashlight, and a waterproof casing! It also features dual USB ports. The one delivers a charge at 5V/1.0A, and the other, at 5V/2.1A for ultra-quick charging. It’s input is rated at 5V/2A though. Furthermore, it has an integrated 4 LED power status indicator, auto power-down feature, and an impressive battery life. Because it is made with a lithium polymer core, you can expect the Unifun to last for at least 1000 cycles. It also comes with a powerful LED flashlight for all of those late-night emergencies. The Unifun measures in at 1.12 x 2.97 x 0.58 inches and weighs 0.66 lbs.